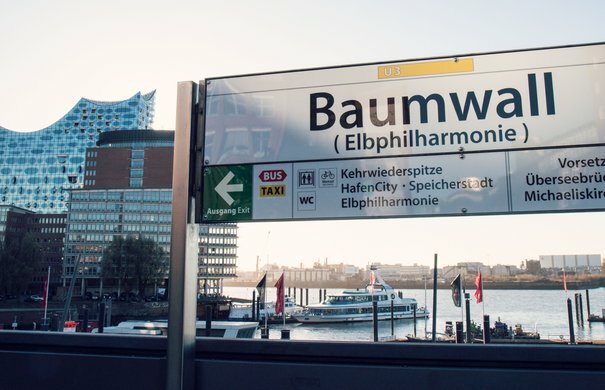 By bus, underground, bicycle or ferry – plan your visit to the Elbphilharmonie. Concert tickets may be used on public transportation for one round trip to the Elbphilharmonie (valid in the HVV-Gesamtbereich incl. Schnellbus) on the day of the event. A Plaza ticket is not valid for public transportation. There are bicycle stands available in front of the Elbphilharmonie. Please note that visitors to the Elbphilharmonie should use the entrance marked »Elbphilharmonie«. 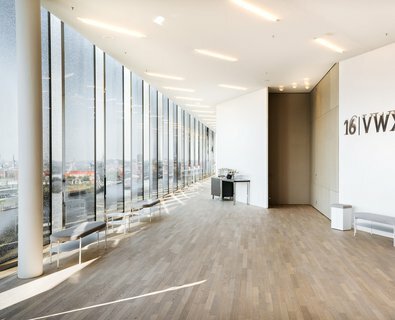 The entrance »Elbphilharmonie Hotel« is reserved for »The Westin Hamburg« hotel guests. It is not possible to reach the Plaza or the concert halls directly from the parking garage. Use the B group elevators to travel to the ground floor. After passing admission control visitors can make their way to the Plaza via the Tube (long escalator) or the A group elevators. All visitors enter the building via the main entrance. Admission takes place at the main entrance and is by concert ticket or Plaza ticket only. The »Tube«, an 82-metre-long, curved escalator, leads visitors up to the Plaza and foyers of the Grand and Recital Halls following admission. Purchase or pick up your reserved concert tickets at the Ticket Shop on the ground floor of the Elbphilharmonie. 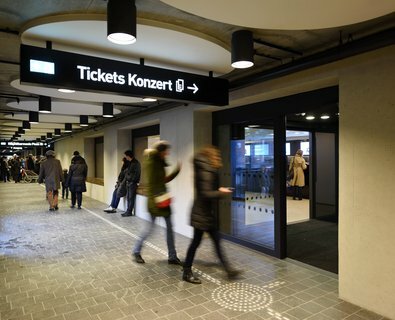 Follow the sign »Tickets Konzert« on the right-hand side of the Tube in the main entrance area. The Ticket Shop is open 11:00–20:00 daily. 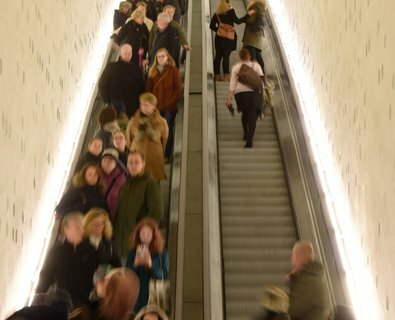 The Tube leads visitors from the main entrance of the Elbphilharmonie up to the panorama window on the 6th floor; visitors then take a second, shorter escalator up to the Plaza on the 8th floor. The Plaza can also be accessed via lifts. These are located on the right-hand side of the Tube. Please note that the Plaza cannot be accessed from the parking garage directly; visitors must first travel to the ground floor to reach the Plaza. The Elbphilharmonie Plaza is a public space. The restricted capacity of the Plaza is regulated by the issue of Plaza tickets. 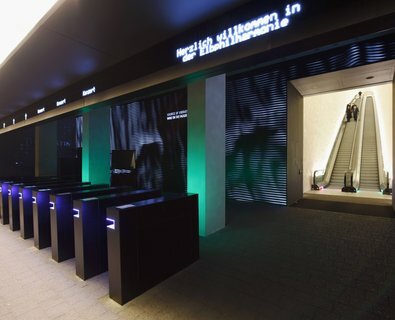 Plaza tickets are available online, in the Elbphilharmonie Visitor Center or via ticket machines located in the main entrance area of the Elbphilharmonie. The Grand and Recital Halls are accessible solely via the Plaza on the 8th floor. From the Plaza, access to the Grand and Recital Hall foyers is via stairs and lifts. The hall entrances are situated on floors 12, 13, 15 and 16; the entrance to the Recital Hall is on the 10th floor. 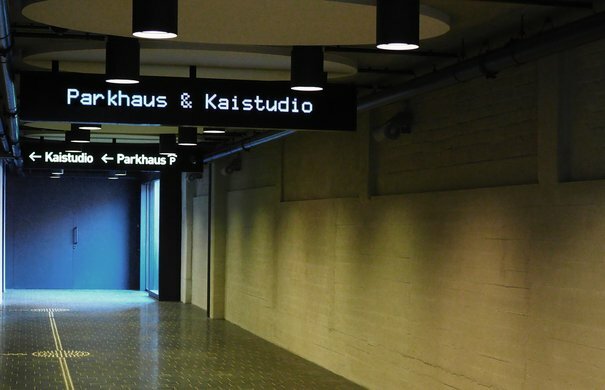 The Kaistudios are located on floors 2 and 3 and can be reached using stairs and lifts via the main entrance. Please follow the signs in the tunnel to the right of the long escalator. »Störtebeker Elbphilharmonie«’s restaurant can be accessed via the »Tube«. The first escalator brings diners to the entrance, located adjacent to the panorama window on the 6th floor. 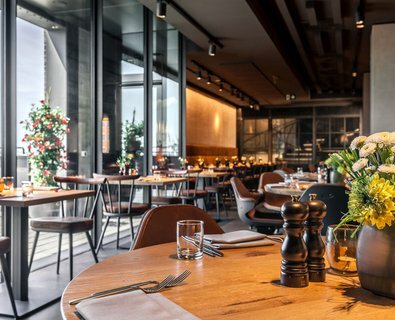 The takeaway café »Deck & Deli« on the Plaza of the Elbphilharmonie offers refreshing drinks and light snacks. Diners require a ticket to access the Plaza and the restaurant. When reserving a table at the restaurant, diners receive the appropriate number of Plaza tickets along with their reservation confirmation by email. »The Westin Hamburg« Hotel has its own dedicated entrance located on the left-hand side of the main entrance area of the Elbphilharmonie. »The Westin Hamburg«’s restaurants, bars and cafés can likewise be reached via this entrance. The Elbphilharmonie is a special building situated in a special place. Allow plenty of time for getting to the Elbphilharmonie and the way to the concert area. Late seating is not guaranteed and latecomers may not be admitted to the concert hall. We suggest arriving at the main entrance 30 minutes before the start of the concert or event. Concert tickets for the Grand and Recital Halls authorise a visit to the Plaza from two hours before the start of the concert or event. Visitors to the Kaistudios and all other visitors require a Plaza ticket to visit the Plaza. The foyers of the Grand Hall and the Recital Hall open their doors 90 minutes before the start of the concert or event. The bars in each foyer open at the same time. If you arrive late to a concert or event, ushers will indicate an appropriate time for you to enter the hall, generally during the applause between works. Please note that late seating is not guaranteed and latecomers may not be admitted to the concert hall. Allow plenty of time for getting to the Elbphilharmonie and the way to the concert area. 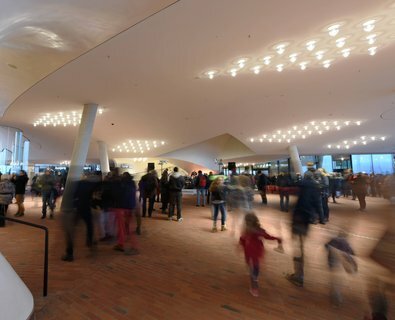 We suggest arriving at the main entrance of the Elbphilharmonie 30 minutes before the start of the concert or event. Photography or filming during guided tours of the Elbphilharmonie is not permitted. The main cloakroom of the Grand Hall is situated on the 11th floor, at the south and north side of the Elbphilharmonie. A cloakroom for guests of the Recital Halll can be located in the foyer of the Recital Hall on floor 10. The following items are not allowed to be taken into the halls and must be checked in at the cloakroom: baby carriages; wheeled walkers; walking-stick umbrellas or similar bulky items; women's or men's handbags, sport bags, backpacks and suitcases larger than DIN A3 (42 cm x 30 cm). If required, wheeled walkers can be parked in the immediate vicinity of the hall entrances. Our front of house staff is happy to assist you in this regard. Fully licensed cash bars are open to guests on all levels of the Grand Hall Foyer and in the Recital Hall Foyer prior to each concert or event and during the interval. Toilet facilities are located in the foyer areas of each corresponding hall. Grand Hall: The central toilet facility is located on the 13th floor of the Grand Hall Foyer. Further facilities can be found on floors 11, 12 and 15. Fully accessible toilets for persons with mobility disabilities are located on floors 12 and 13. Recital Hall: Facilities for guests of the Recital Hall are located in the Recital Hall Foyer. Visitors that exit the hall can only be guaranteed admission during the interval. Found or lost an item? Found items should be handed in to the security staff on the Plaza, at the main entrance or at the security office at the south-east corner of the Elbphilharmonie. Lost items can also be retrieved here. Please come by in person; the security office is not reachable by phone or email. We take accessibility for persons with disabilities very seriously, so we have set up a whole page dedicated to the accessibility of the Elbphilharmonie and Laeiszhalle. The Elbphilharmonie Visitor Center is located opposite the main entrance of the Elbphilharmonie. A selection of Elbphilharmonie merchandise and tickets for a visit to the Elbphilharmonie Plaza can be purchased here. 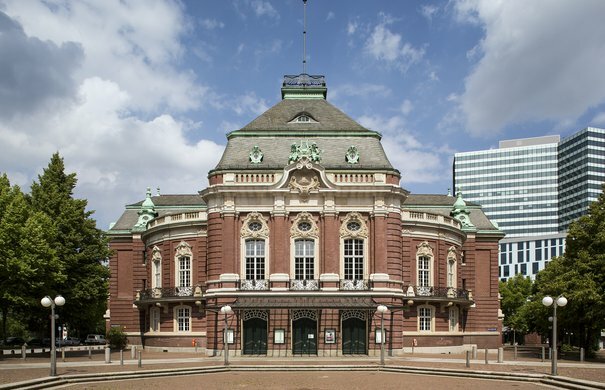 The Laeiszhalle can be reached easily by underground, bus or bicycle. Three parking spaces for visitors with disabilities are located at the entrance on Gorch-Fock-Wall. Six parking spaces for visitors with disibilites are available in front of the Artists’ Entrance on Dragonerstall.